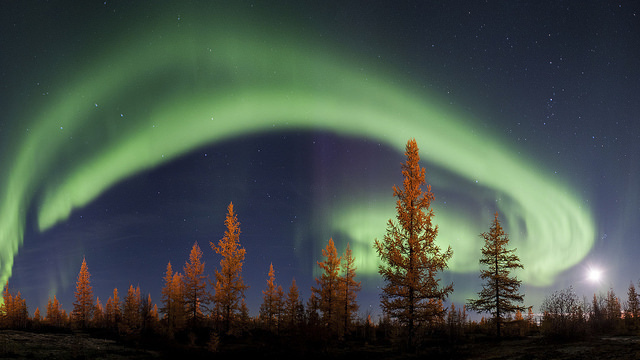 Northern lights cast a green glow in Siberia. This month's issue of the magazine Words Without Borders, entitled Charged With Humanity, features women's writing from Hungary and tales of displacement from Lithuania. The stories below---of a rigged trial and a misunderstood meal--- seem particularly likely to spark classroom conversation. Though vastly different in setting, mood, and style, both stories immediately engage the reader in dramatic and fateful questions. "Stealing is going to be tough tonight," thinks the teenage girl narrating "The Trial," but what choice does she have? Her mother is dying of thirst; they need wood to melt ice into water. Would they have done the same? Would they have admitted to the "crime"? We are surrounded by grandeur: the immense tundra, as ruthless and infinite as the sea; the vast Lena estuary backed up with ice; the colossal, hundred-meter pillar caves on the shores of Stolby; and the Aurora Borealis. Against a background of such majesty, we are the pitiful things here—starved and infested like dogs and nearly done rotting in our befouled and stinking ice caves..
Have students try their own juxtapositions of nature and humanity, perhaps sharing an example or two from the visual arts, such as Breugel's Massacre of the Innocents; the calm landscape in the background of that painting throws the human's horrifying acts into even greater relief. There are many resources on Soviet prison camps, and the innocent people sent there, in the Context and Playlist tabs for The Wondrous Deer of the Eternal Hunt, an oral history of a teenage boy's experiences in the gulag, from Nobel laureate Svetlana Alexeivich. For a different side of Siberia, students might read Yuri Rytkheu's A Dream in Polar Fog, set during an earlier time, and depicting an encounter between ethnic Chukchi people and an injured Canadian explorer. Or, you might have students compare this vividly remembered trial to Kafka's parable. From Krisztina Tóth**, one of Hungary's foremost authors, comes this tale of culture clash between Greek refugees and their Hungarian hosts. In addition to publishing the story, WWB also provides audio of the author reading it in the original. Before students begin reading, you might have them listen to a bit of the recording and speculate about the story's mood. A few months ago, also in Words Without Borders, Peruvian immigrant Marco Avilés wrote about "the friendly vibes that food never fails to generate." With "The Tongue's Story," we see that food sometimes generates very different vibes indeed, as Hungarian villagers serve a misunderstood meal to a group of Greek refugees. Ground poppy seeds, traditionally sprinkled on pasta in Hungary, look like dirt and ashes to the tired and frightened Greeks. Imagining an insult is intended, the men angrily pour the seeds into the dining hall's sink. What do you think the men should do? “The Tongue’s Story,” having at its core the organ of speech and of taste, recounts a failed encounter between people from different cultures—a group of refugees from the Greek civil war around 1950, and the inhabitants of a rural Hungarian area where these are taken for shelter. Tóth’s sparse, economic prose presents small vignettes of banality, beneath which lurks the symptomatology of a history never fully confronted, a choice bound to reproduce old biases at every step. Her mapping of contemporary Hungarian paralysis shows the inevitable interconnectedness of private and public self-delusions. After reading and analyzing the story, students might rewrite it from the point of view of one of the Hungarian women serving the refugees. Some students may also be interested in making the dish that causes the trouble; they can find a recipe on Hungarian Tidbits, a food and culture website. For other stories of food, which can be read alongside this one, see the blog post "Chapatas and McDonald’s". Or, students may wish to learn more about why the refugees were fleeing Greece. The Origins online history project has published a brief overview of the Greek Civil War, beginning with the stark sentence, "The years 1940–1949 were ones of continuous horror for the Greek people." Another, more in-depth resource is the online multimedia book Dangerous Citizens, from Columbia University ethnographer Neni Panourgiá. This book has a definite slant (and a few expletives), but includes rich, authentic materials. * Pronounced, to the best of our knowledge, "Grin-kev-i-chi-oo-eh"